Lean, a systematic approach to understanding and optimizing processes, is proven to help organizations improve outcomes and achieve their objectives. 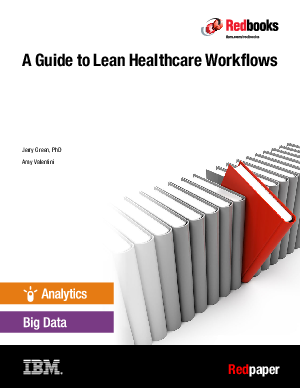 Learn more in this new IBM® Redpaper™ publication, A Guide to Lean Healthcare Workflows, by Jerry Green, PhD, and Amy Valentini of Phytel, An IBM Company. Describes each step in-depth and includes techniques, example worksheets, and materials that can be used during the overall analysis and implementation process. Provides insights that are derived from the real-world experience of the authors. The steps are based on a universal Lean language that uses industry-standard terms and techniques and, therefore, can be applied to almost any process.